Things have been happening at Junction Workshop. Every available horizontal surface is now supporting a growing collection of half finished pieces, potential pieces in the form of huge leatherhard slabs, drawings, linocuts (for making impressions) and a huge sandbed in which the next group of pieces will be formed. The walls are also beginning to fill up, as I experiment with various hanging and supporting methods. 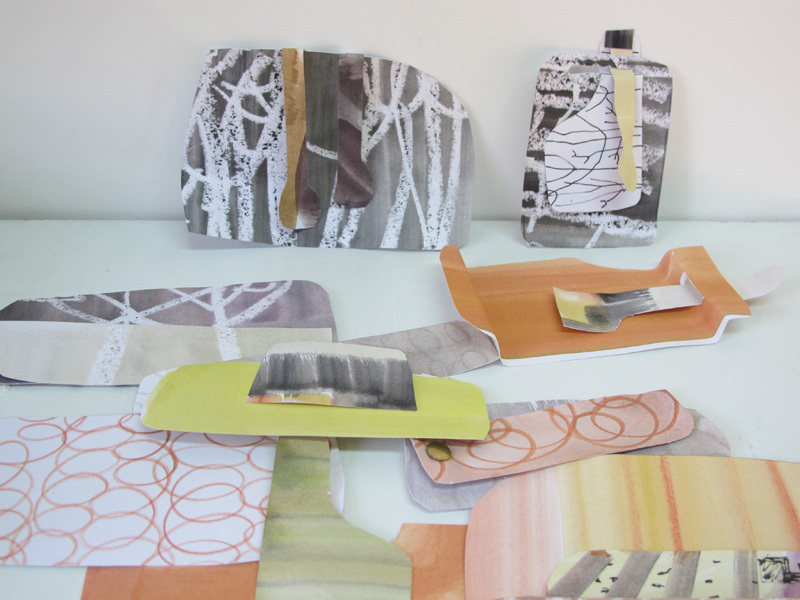 I am excited by the idea of making pieces that function both as sculptural wall pieces and functional platters or groups of plates or spoons – the way the project is developing is very fluid at the moment, but a theme is emerging that involves pockets, hooks and boxes, all hanging on the wall. These pieces all involve experimenting with plates in pockets. By simplifying my drawings I am able to make some dramatic juxtapositions without losing the sense of place. Another thread I’m following involves the development of my ‘hedge candelabra’ into wall pieces. These can be hooked invisibly to the wall and create glorious shadows. It’s been a huge pleasure to be working with my (funded) assistant Pippa, not only because she rolls all my slabs, but also because she radiates sunshine and works tirelessly to help solve all the little problems that inevitably crop up in the making of new work. I sneakily took some pictures of her working, but have decided not to publish without consent! 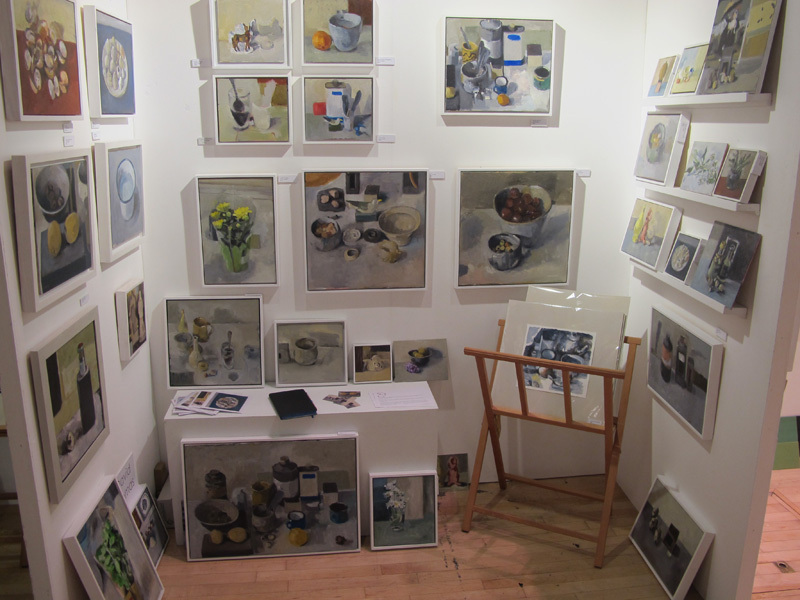 Last weekend found us in Oxford for a very successful and enjoyable Oxford Ceramics Fair, and the private view of the ‘Teabowls’ exhibition at Oxford Ceramics Gallery. 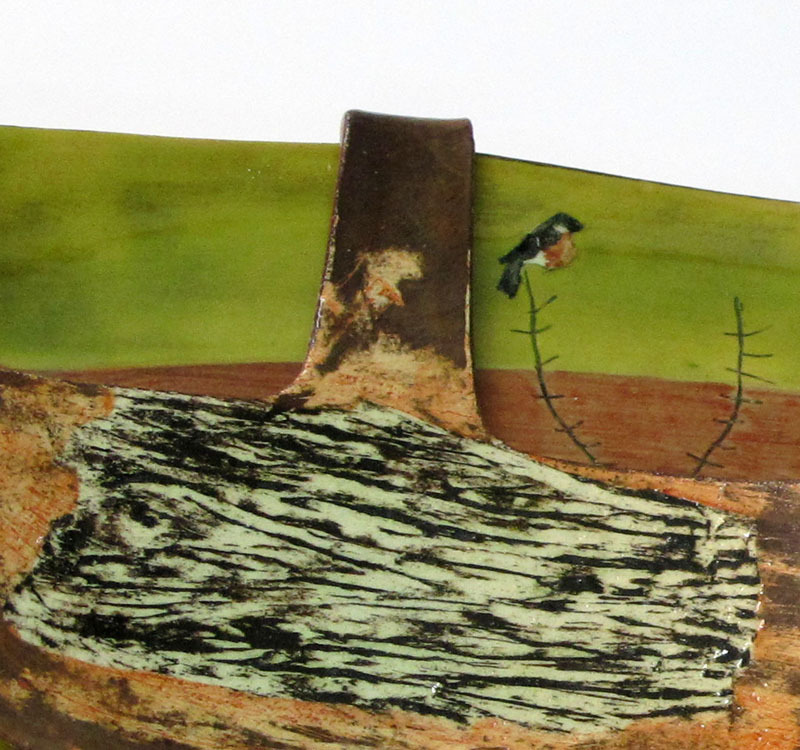 It was gratifying that both visitors and potters enjoyed my new work and sales were up on last year. 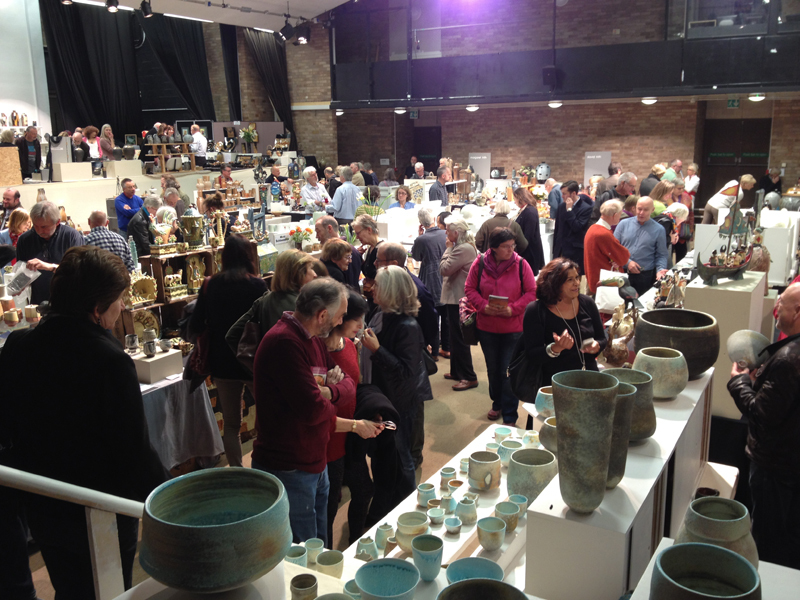 Oxford Ceramics Fair has been running for 15 years, organised by potters Jude and John Jelfs with support from the Craft Potters Association; it has developed a strong identity as a venue for high quality studio ceramics with an enthusiastic and knowledgeable following of visitors and collectors. My thoughts turning to my flatware project, I decided to take a look at the plates and wall pieces on show. Surprisingly, more than half the potters had some form of platter on their stands (large plates being notoriously difficult to fire); only two were showing non-functional wall-mounted pieces. There were strict limits to the heights of stands this year (zealous risk assessment) and also, being primarily a studio ceramics event, the more contemporary makers have not chosen to attend, but it was an interesting observation. Here is a slideshow of all the Oxford platters. I’ve been all over the country in the last couple of weeks, as well as trying to fit in some work. Brighton Art Fair was an interesting experience. As well as being very happy to be with David while he was selling so well, spending the weekend alongside my sister, printmaker Tessa Pearson, and other talented and friendly artists was a joy. It was interesting to note the differences between fine art and ceramics fairs, in the reactions and expectations of both artists an visitors. It was a different vibe. If I am to be making work aimed at a more of a fine art market I will need to study this. And… significantly less hard physical work than a ceramics fair. We stayed with Tessa Wolfe Murray, an old friend and previously my assistant. 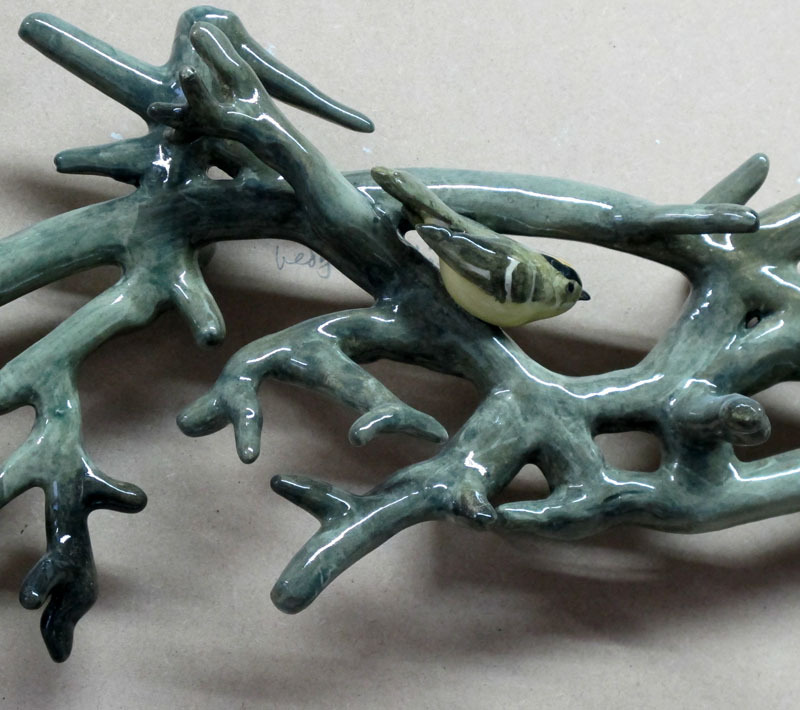 Her ceramic work is spread equally between functional ware – vases, lamp bases and such – and wall pieces. Here she has been exploring textures and pattern arising from architecture and decaying natural surfaces, found on her various travels around the world. The panels are up to 40cm high and Tessa has developed various simple ways to hang them, using blocks and cord. On the ‘ceramics arts daily ‘blog, Cristine Boyd discusses her method of hanging which enables pieces to double as functional or wall pieces. It could be off-putting to use a platter which has wires permanently attached; equally its is fiddly to have to reassemble a hanging mechanism each time a platter is used. Christine’s solution seems very practical. She uses sewing snaps (press studs) attached to picture wire inserted into a keyhole shaped groove in the back rim of the plate to form a removable hanging device. The article is a bit long to include in full here. While in Brighton I also visited Marion Brandis, a maker of large ceramic tile panels, architectural ceramics and mosaic. I saw some of her beautiful plates and animals, tinglazed and decorated with hand drawn decals. Then on to Charleston Farmhouse, where I found that the famous painted surfaces and furniture more exciting than anticipated. Back in the studio, the stimulation of the weekend resulted in an outpouring of ideas. Paint and scissors were flying.